My last post on Ruskin 2 years ago was hopelessly inadequate because I was so distracted at the time http://www.bookofdaystales.com/john-ruskin/ This is much better. 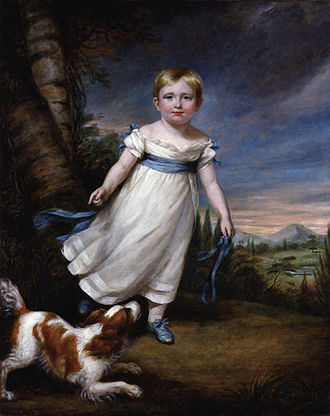 Today is the birthday (1819) of John Ruskin, leading English art critic of the Victorian era. He was also a patron of the arts, draughtsman, watercolorist, social thinker and philanthropist. He wrote on subjects as varied as geology, architecture, ornithology, literature, education, botany and political economy. His writing styles and literary forms were equally varied. Ruskin wrote essays and treatises, poetry and lectures, travel guides and manuals, letters and even a fairy tale. His early writing style when writing about art was elaborate but he later toned it down for plainer language designed to communicate his ideas more effectively. In all of his writing, he emphasized the connexions between nature, art, and society. He also made detailed sketches and paintings of rocks, plants, birds, landscapes, and architectural structures, and ornamentation. He was hugely influential in the latter half of the 19th century, and up to the First World War. After a period of relative decline, his reputation has steadily improved since the 1960s with the publication of numerous academic studies of his work. Today, his ideas and concerns are widely recognized as having anticipated interest in environmentalism, sustainability, and craft. 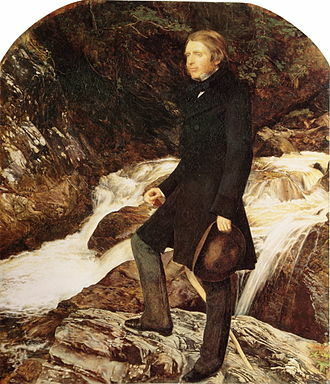 Ruskin came to widespread attention with the first volume of Modern Painters (1843), an extended essay in defense of the work of J. M. W. Turner in which he argued that the principal role of the artist is “truth to nature”. From the 1850s he championed the Pre-Raphaelites who were influenced by his ideas. His work increasingly focused on social and political issues. Unto This Last (1860, 1862) marked the shift in emphasis. 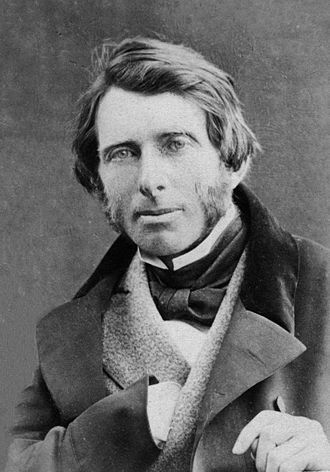 In 1869, Ruskin became the first Slade Professor of Fine Art at the University of Oxford, where he established the Ruskin School of Drawing. In 1871, he began his monthly “letters to the workmen and labourers of Great Britain”, published under the title Fors Clavigera (1871–1884). In the course of this complex and deeply personal work, he developed the principles underlying his ideal society. As a result, he founded the Guild of St George, an organization that endures to this day. As with many of the “greats” whom I celebrate here, there is way too much to say about Ruskin. If you need to know more there are plenty of places to find information on him. I’m going to focus on one adventure of his, now known as the Ruskin Diggers, which I think symbolizes his life’s work. We were coming down the street—a troop of young men, some of them like myself only nineteen, going to river or tennis-court or cricket-field—when Ruskin going up to lecture in cap and gown met us. He seemed troubled and prayed us to go back with him to his lecture, which a few of us did, and there he spoke to us not on art this time but on life, saying that it seemed to him to be wrong that all the best physique and strength of the young men in England should be spent aimlessly on cricket ground or river, without any result at all except that if one rowed well one got a pewter-pot, and if one made a good score, a cane-handled bat. He thought, he said, that we should be working at something that would do good to other people, at something by which we might show that in all labour there was something noble. Well, we were a good deal moved, and said we would do anything he wished. 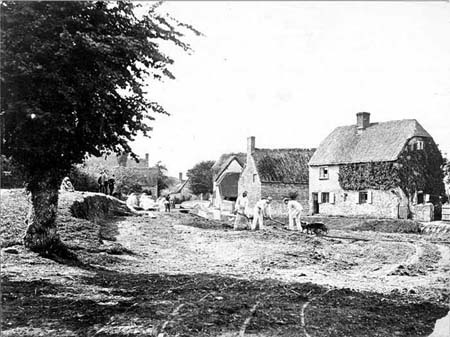 So he went out round Oxford and found two villages, Upper and Lower Hinksey, and between them there lay a great swamp, so that the villagers could not pass from one to the other without many miles of a round. And when we came back in winter he asked us to help him to make a road across this morass for these village people to use. 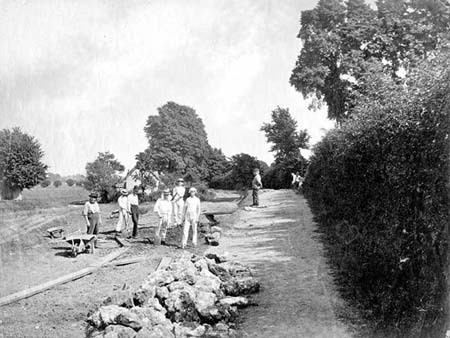 So out we went, day after day, and learned how to lay levels and to break stones, and to wheel barrows along a plank—a very difficult thing to do. And Ruskin worked with us in the mist and rain and mud of an Oxford winter, and our friends and our enemies came out and mocked us from the bank. We did not mind it much then, and we did not mind it afterwards at all, but worked away for two months at our road. And what became of the road? Well, like a bad lecture it ended abruptly—in the middle of the swamp. Ruskin going away to Venice, when we came back for the next term there was no leader, and the ‘diggers’, as they called us, fell asunder. I believe that the first test of a great man is his humility. I don’t mean by humility, doubt of his power. But really great men have a curious feeling that the greatness is not of them, but through them. And they see something divine in every other man and are endlessly, foolishly, incredibly merciful. A man wrapped up in himself makes a very small parcel. All art is but dirtying the paper delicately. Every increased possession loads us with new weariness. No changing of place at a hundred miles an hour will make us one whit stronger, or happier, or wiser. There was always more in the world than man could see, walked they ever so slowly; they will see it no better for going fast. 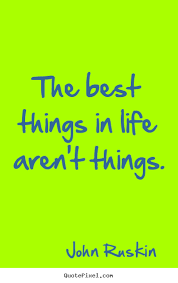 The really precious things are thought and sight, not pace. It does a bullet no good to go fast; and a man, if he be truly a man, no harm to go slow; for his glory is not at all in going, but in being. Modern traveling is not traveling at all; it is merely being sent to a place, and very little different from becoming a parcel. You will find it less easy to unroot faults than to choke them by gaining virtues. Do not think of your faults, still less of others faults; in every person who comes near you look for what is good and strong; honor that; rejoice in it and as you can, try to imitate it; and your faults will drop off like dead leaves when their time comes. Remember that the most beautiful things in life are often the most useless; peacocks and lilies for instance. Cookery means the knowledge of Medea and of Circe and of Helen and of the Queen of Sheba. It means the knowledge of all herbs and fruits and balms and spices, and all that is healing and sweet in the fields and groves and savory in meats. It means carefulness and inventiveness and willingness and readiness of appliances. It means the economy of your grandmothers and the science of the modern chemist; it means much testing and no wasting; it means English thoroughness and French art in Arabian hospitality; and, in fine, it means that you are to be perfectly and always ladies — loaf givers. Perfectly Ruskin-esque: bread is the staff of life. Not much help in choosing a recipe, however, other than for me to tell you to go and bake a wholesome loaf. So, I am going to be inventive and show you what I made for breakfast today. This year (2016) today is Collop Monday in England, that is, the Monday before Ash Wednesday. In Victorian times it was a common custom to have a collop for breakfast right before Lent. “Collop” is a dialect cognate of the French loan word “escalope” which generally means a thin slice of meat (sometimes flattened with a mallet). Typically on Collop Monday people ate a collop of bacon and a fried egg for breakfast, as prelude to the Lenten season when meat and fat are forbidden. Living in Italy, a rustic slab of English bacon is not easy to come by, and, besides, bacon and eggs is a little pedestrian as a celebratory meal, I think. I happened to have some beef scaloppine in the refrigerator, so I cooked up a hearty breakfast of beef collops, cheese, and vegetables. 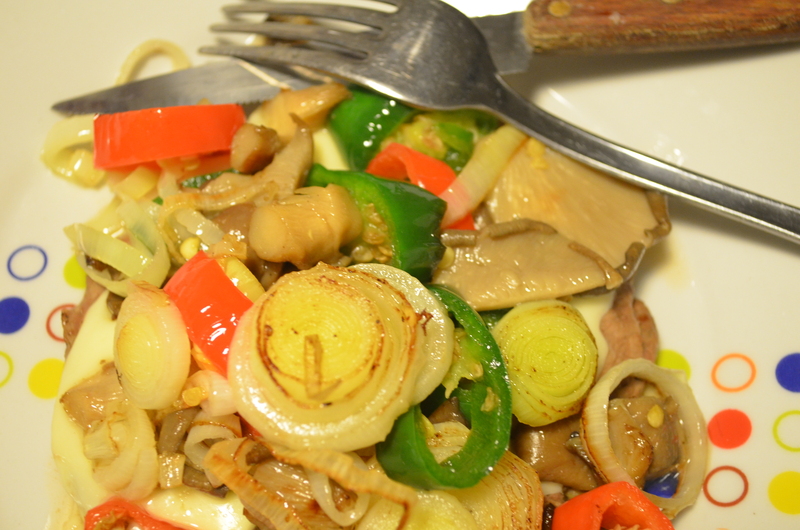 I began by sautéing sliced mushrooms, leeks, and hot peppers in olive oil. Then I pan fried the beef and topped it with cheese. 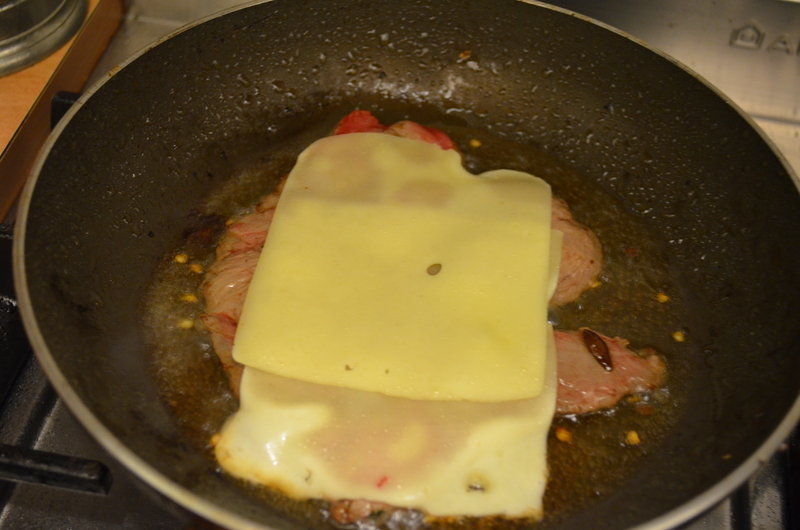 Then I served the beef and melted cheese with the veggies on top – color, sight, sound, smell, and taste. Feed your inner Ruskin ! !